Dreams and Health: cortisol and dream-content | van Doorn on dreaming! 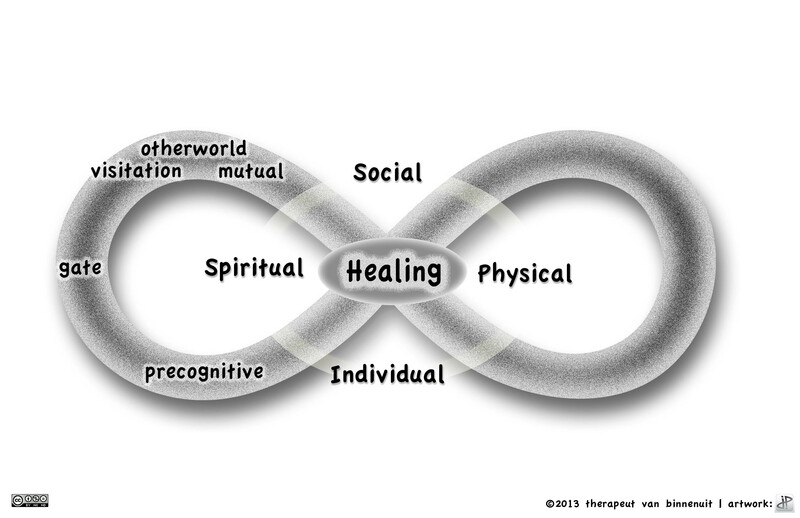 My current research involving dreams and health has got its origin in my Infinity Model of Healing (see the picture above). Last summer I was collecting dreams about the deceased. Processing them allowed me to connect mourning about any kind of loss with the natural tendency for humans to make sense of it all. A worldwide survey seemed to divide dreams about the deceased into five categories: precognitive dreams, gate -dreams, otherworld dreams, visitation deams and mutual dreaming. If you want to read more about it, I wrote a book explaining the energy of those dreams and how to work with them. But I believe health is influenced by more than spirituality and believes alone. Being chronically ill myself I can clearly distinguish four independent variables: the spiritual, the social, the individual and the physical part that constitutes your health. Physical has got to do with the place where you are born: if you are born above the 52nd degree of the equator you are likely to have a vitamine D deficiancy, with your gut and the way you use and process food. But let’s take a closer look at the relationship between your body and your dream-content. Cortisol is a hormone that is related with the day-night rythm. Cortisol makes you alert, raises your bloodsugar level, it makes you ready to go. It prepares your body for stress, that is why it increases your bloodsugar level. You need your bloodsugar level to be high when you are struggling for existence. Cortisol reduces infection: when you are running to safe your life you have no time to be ill (that is why so many people get ill on holiday when they relax). So how does this important hormone interfere with your dream content? When cortisol is high you are in REM sleep. Dreams you have during high cortisol levels are more fragmented and therefore the brain will construct a more bizar story. Research shows that a high level of cortisol also interferes with memory consolidation. As we age, cortisol level rises. So how can we reduce the cortisol level in a natural way? We can exercise. Cortisol helps you to wake up go out of bed and get you something to eat. We are not build to walk to a refrigerater and find food there. We are build to walk, run, and capture ourselves a meal. Walking before eating is one of the most natural things to do. Another way to reduce cortisol is to elevate serotonine. You can do this by eating nuts, banana’s kiwi, tomatoes and grapefruit. Also if you induce oxytocine levels, cortisol drops. If you are not in the mood to fall in love, you could arrange a massage (or do both). If you have had an accident, illness or picked up on one from a friend, spouse or child and you are willing to share it with me here is the survey. All results will be processed anonymous. This entry was posted in Dreams, Health and Wellness, Infinity Model of Healing, Uncategorized and tagged gate dreams, health, high cortisol levels, infinity model, medicine, mental-health. Bookmark the permalink.